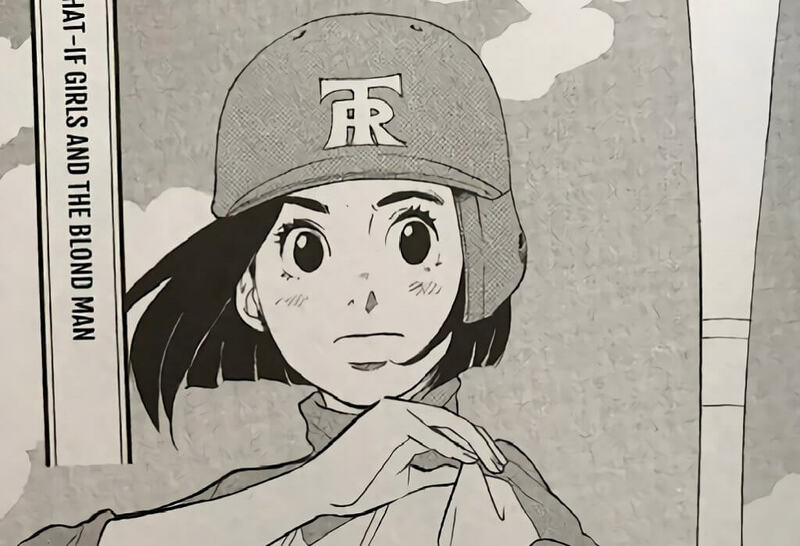 The baseball metaphor comes up often in Tokyo Tarareba Girls. We are all heroes of our own stories, even though sometimes it might seem like things are out of our control or as though nothing is going our way. But, as we all know, every protagonist must prepare for their own apex. Tokyo Tarareba Girls is the story of Rinko and her friends, who are unsatisfied with the current state of their lives. Rinko, for example, is not succeeding in her career or in her dating life, and she’s not coping well with those facts. Reality hits them hard when they also realize that they aren’t as young as they used to be, which limits their opportunities for things, such as dating. With the Tokyo 2020 Olympics looming over them, these women, however, have set a deadline for themselves to kick it into overdrive to find love and achieve success. “Tarareba” is actually a pun using Japanese grammar. Both the -tara and -reba form are used in conditional or hypothetical scenarios, or in other words, ‘what-ifs’. These scenarios, such as “what if I had taken a chance on that guy ten years ago” or “what if I don’t get married by a certain age,” plague the minds of our starring ladies, and lead them to be called “what-if women” by other characters. While caught up in their world of what-ifs, they’re discovering that life is quickly passing them by, but they’re not about to let that happen any longer. The strongest feature in this manga is the friendship between Rinko, Kaori, and Koyuki. Despite being fictional manga characters, author Akiko Higashimura takes care and time to depict them as realistic and relatable women. They have passions which they’ve turned into careers. They have insecurities and dreams. More than anything else, they’re imperfect, and that’s okay. Their girls’ nights at Koyuki’s pub are a haven. This is where we learn a lot about these women. While they’re enveloped in their laughter, rants, and meals, they’re in their own bubble and unaware of what’s going on around them. Higashimura reminds us, however, that this is not how reality works. Despite being rude to them by reminding them of their age and calling them “what-if women,” Key, a young man who often overhears their rants at the pub, is their wake-up call. By playing the role of an outside observer, he’s also the fresh perspective that this manga needs. A typical girls’ night out for our main characters. Unlike the other men introduced so far in this volume, Key is also the only one to seriously critique these women rather than brush them off. While tactless, one could also argue he cares the most about whether these women cope with their reality and move forward. It’s when reality is the harshest, however, that a girls’ night becomes truly important. Rinko’s group of friends is supportive, but also protective. The girls’ night out allows them to be vulnerable and honest with themselves. It’s refreshing to see such a raw depiction of their lives because, let’s face it, plan A doesn’t always work out. Sometimes plans B through D fall through too, and when plans fail, it can help to complain. Higashimura flawlessly blends humor with their commiseration. Just as quickly as they complain about work and love, they’re also cleverly coming up with new strategies each time something goes awry. That constant rebounding keeps the story interesting and engaging. There are a few issues with this volume, but one thing that stands out is that some panels are text-heavy, which makes things difficult to read. The crowding, however, does serve a purpose: it mimics and conveys how loud and jumbled the pub conversations can get. These aren’t dainty discussions; they’re full-bodied, emotional rants. The easiest solution I have for this is to take breaks while reading. Furthermore, not much attention is given to the other women in this volume, but since this is only volume one, I suspect future volumes will feature other characters. “So no one told you life was gonna be this way” from Friends, which the women mention in this manga. 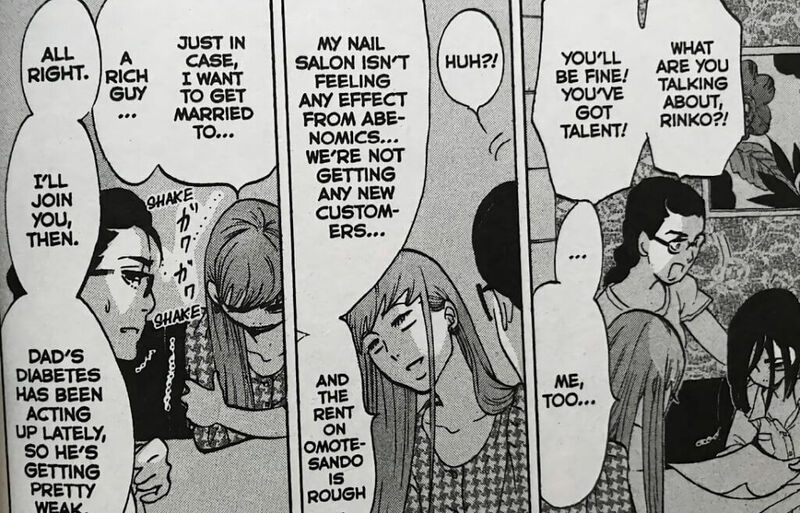 While the topics of marriage and dating come up often in this manga, they are not necessarily the end goal. The manga shines when you realize that what these women want is more than just a boyfriend; they’re seeking fulfillment that they aren’t finding from the typical outlets. The buildup of Rinko’s plateauing career and her bad luck with love makes her realize how hollow she feels inside. Kaori’s lack of customers makes her feel insecure. While Rinko is down in the dumps in this volume, her fighting spirit won’t allow her to stay that way. I doubt her supportive friends would let that happen either. Just like in Princess Jellyfish, Higashimura excels in this manga. Her writing is funny, clever, and entertaining. This story is delightful so far, and has a good balance of introspection, misfortune, and humor. I enjoyed getting to know Rinko and her friends, as they are lovable and endearing. 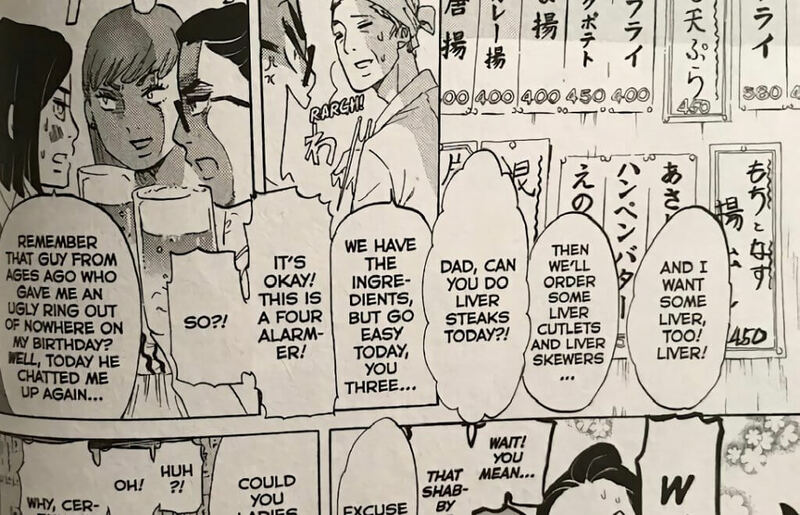 In one volume, Higashimura has already successfully characterized them through their friendship, and I want to see what their future girls’ nights out will be like. I’m intrigued by Key and want to understand his motives. I also want to see these women succeed and grow. Beyond that, this manga is worth reading not only because it is refreshing and fun, but also it sends a nice message to readers: life can be hard, and it’s okay to fail, but that doesn’t mean you should be afraid to try. To read Tokyo Tarareba Girls, please visit Kodansha’s website! To learn more about Tokyo Tarareba Girls, please visit Anime Planet’s website! A voracious reader and self-proclaimed Noragami expert, Mim loves reading manga and sharing her thoughts with other fans. Feel free to chat with her about what you're reading or throw a recommendation her way. You can check out some of her work on her YouTube channel.